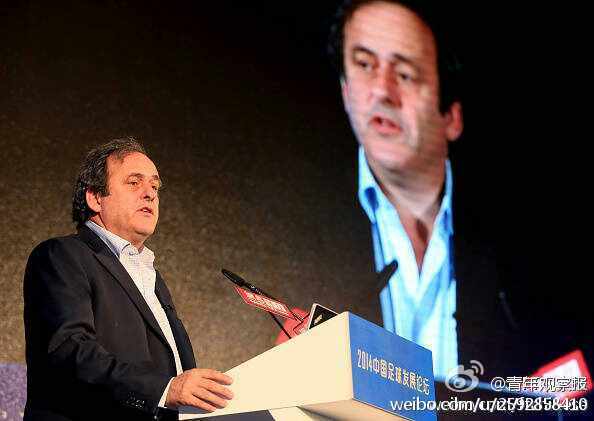 But it was indeed Michel Platini, who had squeezed 36 hours into his busy schedule to accept an invitation from Netease Sport, and taking the opportunity to make the opening speech on the 2014 China Football Development Forum. He also promoted the Chinese language version of his new book, Parlons Football. The title means Let’s Talk Football, however, in Chinese, it was translated to Football In Suits, which originated from Platini’s own transition from a top footballer to an influential football politician. During his visit, Beijing was in the whirlwind of the Apec conference, hence, Platini could only make a very low-key visit, having dinner with the head of the Chinese FA. His charismatic personality attracted a lot of praise from Chinese media and football industry people alike. By maintaining and approachable and populist profile, in marked contrast to past visits of FIFA officials, he won the respect of the people. And he was very straightforward in his opinions about almost all the hot issues, including reform in FIFA, the certainty that Qatar World Cup 2022 would ‘definitely be held in winter’, his White Card proposal, and his vision for European football in the future. 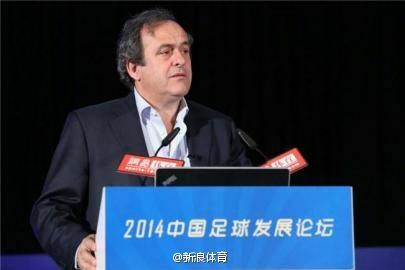 Platini saw quite a lot of similarities in the Chinese and French societies, and his tone seemed to be more down to earth than other football leaders. Whether the CFA or higher government departments take his advice or not, Platini raised his profile during this 36 hour visit, through a profile-lowering way.